In this article, you will learn to create whisker and box plot in R programming. You will also learn to draw multiple box plots in a single plot. 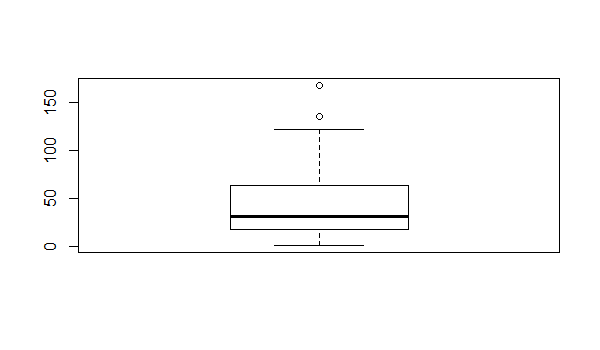 In R, boxplot (and whisker plot) is created using the boxplot() function. The boxplot() function takes in any number of numeric vectors, drawing a boxplot for each vector. You can also pass in a list (or data frame) with numeric vectors as its components. Let us use the built-in dataset airquality which has “Daily air quality measurements in New York, May to September 1973.”-R documentation. 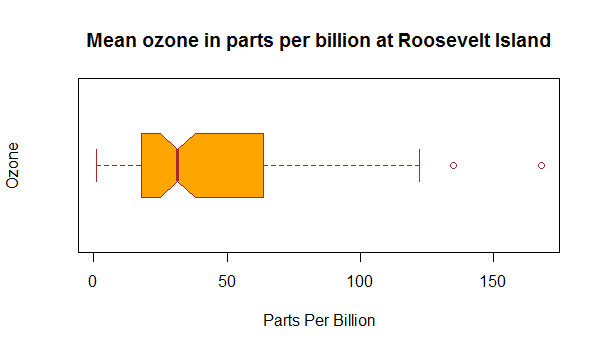 Let us make a boxplot for the ozone readings. We can see that data above the median is more dispersed. We can also notice two outliers at the higher extreme. We can pass in additional parameters to control the way our plot looks. You can read about them in the help section ?boxplot. Some of the frequently used ones are, main-to give the title, xlab and ylab-to provide labels for the axes, col to define color etc. Additionally, with the argument horizontal = TRUE we can plot it horizontally and with notch = TRUE we can add a notch to the box. The boxplot() function returns a list with 6 components shown as follows. names-a vector of names for the groups. 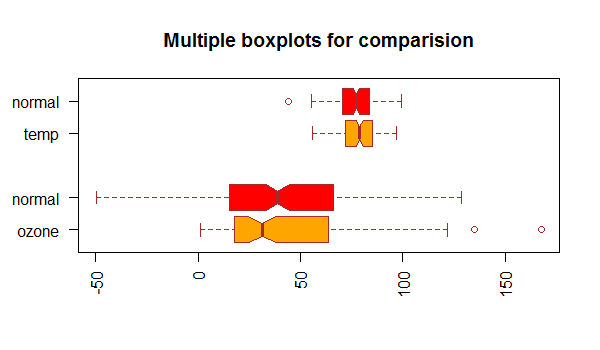 We can draw multiple boxplots in a single plot, by passing in a list, data frame or multiple vectors. Let us consider the Ozone and Temp field of airquality dataset. Let us also generate normal distribution with the same mean and standard deviation and plot them side by side for comparison. Now we us make 4 boxplots with this data. We use the arguments at and names to denote the place and label. The function boxplot() can also take in formulas of the form y~x where, y is a numeric vector which is grouped according to the value of x. For example, in our dataset airquality, the Temp can be our numeric vector. 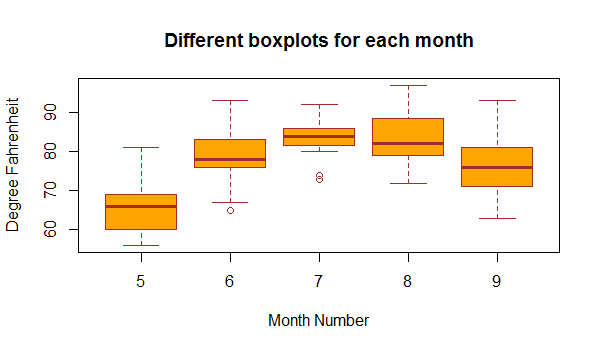 Month can be our grouping variable, so that we get the boxplot for each month separately. In our dataset, month is in the form of number (1=January, 2-Febuary and so on). It is clear from the above figure that the month number 7 (July) is relatively hotter than the rest.